Isn't it a good thing when other peoples' gardens are more beautiful that our own? Definitely yes - we gardeners need something to strive for. Anyone who doubts this must have a look at The English Garden magazine. 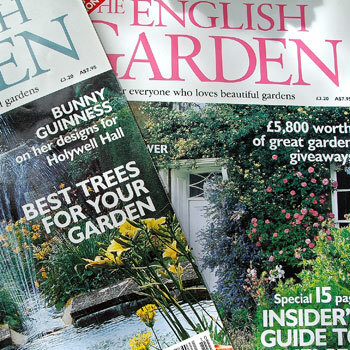 It's THE magazine for those who hanker for a pretty English garden - described on Amazon's website as 'the quintessential ideal of every serious gardener'. My goodness! This is definitely for the totally committed, terribly serious 'hankerer'. All the gardens pictured in The English Garden magazine are guaranteed to look fuller, more colourful, greener, rosier - simply prettier than your own. Take heart! You should be inspired to try harder - or at least to take lots of wistful, evocative photographs of your own patch. The verb 'hanker' means to have a strong desire or yearning for. I didn't make it up!